The books I read last month were notable not only for themselves, but also for the fact that I read them just following a layoff — from the same authors, and in the same order, that I read the first time I was laid off two and a half years ago. I’m tempted to say that such a spooky mirror-image coincidence is a sign that perhaps I shouldn’t purchase books by these authors in tandem! Its eye-catching subtitle, “How Silicon Valley Made Work Miserable for the Rest of Us,” would have caught my eye even if hadn’t already read Lyons’ 2016 Disrupted. Lab Rats is the book that Disrupted probably should have been. Perhaps overly focused on the callousness of the “business decision” when it comes to human beings, Disrupted seemed like little more than an angry reflection of the author’s wounds over his own layoffs, disguised as satire. Lyons leaves the bulk of solution-making up to good-hearted capitalists who choose to set a more responsible, humane course. Humanity doesn’t scale, though, and since the nature of business is growth, relying on smaller firms to do the right thing doesn’t seem sustainable relative to a strong base of well-organized workers. “Still,” I added, “read this book for an unflinching examination of the modern working world, and use its insights to spur action.” If that happens to include organizing? Well, let me know, and I’ll give you a signal boost. Reading 2016’s The Trespasser, I had the sense that French was dialing it in a bit, ready to move on from the Dublin Murder Squad to an entirely new project. That project is The Witch Elm, still a police procedural, but told this time from the victim’s point of view. Like In the Woods’ Rob Ryan, protagonist Toby is missing large parts of his memory, and may also have experienced personality changes as the result of trauma — he is, as some reviewers reflect, rather unlikeable and definitely unreliable. Like French’s sophomore book, The Likeness, this book relies on a big, charming house that represents a significant change in scenery from the protagonist’s usual surroundings. And like her third entry, Faithful Place, the bonds and secrets between family members are under scrutiny in this novel. I found this story to be a refreshing change of perspective to the point of view of the subject of investigation (not the investigators’) and caught elements of her previous novels in this – notably her first three. Although I thought the “whodunnit” was fairly easy to guess this time, the twists lie in the “how do they get out of it?” leading to a satisfying, if somewhat cynical, conclusion. I am, if nothing else, a “late to the party” consumer of many, many media. I watched “Stranger Things” and “The Haunting of Hill House” months after everyone else on Twitter watched and raved about them (and I never did watch “Breaking Bad”). I likewise only managed to read Angie Thomas’ The Hate U Give 4 months after its February 2017 release. 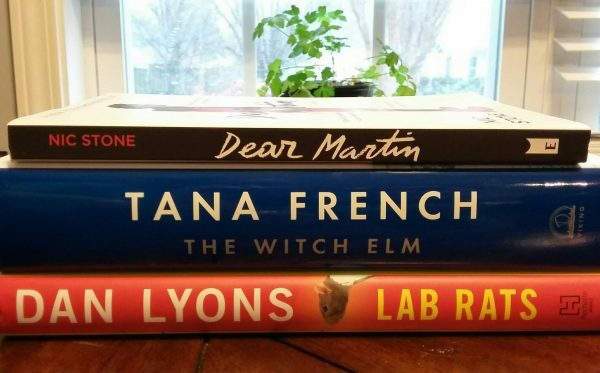 Somehow, Nic Stone’s Dear Martin, released in October 2017, remained on my TBR pile until, well, Dr. Martin Luther King Jr.’s birthday… this year. Dear Martin is a very different book compared to THUG, much more of a “quick hit” than a deep dive — but no less impactful. Where it shines brightest is in showing protagonist Justyce with all the vulnerability and anxiety of any teenage boy — spend time with any youth, listening to them and letting them talk, and you know what I mean. This vulnerability underpins many of the choices Justyce has to make, highlighting how important it is for youth to have access to the people and environments that help route them towards the right choices — and for white people to recognize the odds and the ways in which we contribute to them. William Meikle’s “In the House of the Dead,” a creepy Victorian story in the vein of Conan Doyle, Stoker, and James. Jonathan Winn’s “The Realtor,” a similarly-toned story that’s its own well-thought-out twist on the “ugly stain on the wall” trope. Kenneth W. Cain’s “Desolate,” an emotional take on zombie fiction. The remainder of entries are somewhat uneven, ranging from a Lovecraftian adult horrorfest (which relies on some pretty obnoxious stereotypes), to a young-adult werewolf whodunnit, to a fairly predictable psychological horror story, to a sneak peek of a forthcoming work. For freebies, these are worth the download, and they did introduce me to authors I’d like to read more of, so I guess they did the job! What did you read in January, and what are you reading now? Let me know when you read it, I will be interested to hear what you think of it! I think I struggled a bit because it was the kind of subject matter that needs to go deeper, but Lyons is a very light-touch author who wants to entertain as much as inform. He might leave the heavier texts to the political science section of bookstores, but then, I might go looking there — labor economics has always been an interest of mine.